What Will You Learn in a Beginner Horseback Riding Lesson? 1. How to put tack on the horse. Tack refers to the variety of accessories worn by a horse. Some examples of horse tack are harnesses, bits, and saddles. Knowing how to properly put tack on your horse will ensure that you and the horse are both comfortable. Additionally, putting the horse’s tack on correctly is essential for safety. A saddle put on incorrectly could cause a rider to fall. You will also learn how to properly take the tack off. 2. How to lead the horse on a rope. As a beginner, you will learn how to use a lead-rope. Learning to lead a horse is an important part of ground training. You might be questioning why learning this ground skill is important. Aren’t you supposed to learn how to ride on the horse? Yes, and leading is one of the first steps! Learning to lead your horse will improve your ability to control the horses’ movements and improve your communication with the horse on the ground and on the horse. 3. How to stop and start the horse. You will learn how to stop and start the horse both on the ground and on horseback. On the ground, stopping the horse will include verbal and physical cues. Once on horseback, you will use the reins to control the horse’s movement in addition to other physical and verbal cues. 4. How to mount the horse. Proper mounting technique varies. English and western styles of riding each require their own particular method of mounting the horse. The English style of mounting and western style of mounting a horse differ in hand placement and the type of saddle used. Many beginners struggle to mount on the first time and may require assistance. This is because new riders have not developed the muscle strength needed to mount a horse. With practice, you’ll build up strength and master the mounting technique for your riding style. 5. How to ride at a walk pace. Now that you’ve established communication with the horse and know how to mount the horse, you’re ready to ride! You will begin with a walk pace and practice walking in a circle around an enclosed arena. Riding at a walk pace is a great opportunity for riders to learn how to direct their horse around bends and corners of the arena. A trot pace is slightly faster than a walk, and the horse lifts each pair of diagonal legs alternately. Learning to trot is an exciting step for a beginning rider. The ability to trot indicates that the rider has learned to communicate with the horse and feels comfortable in the saddle. 7. How to move from a seated to standing position in the saddle. The movement from a seated to standing position it called posting. When you reach a trot pace, an up and down movement of the torso occurs naturally. To enhance this movement, the rider presses down into the stirrups and keeps the ankles relaxed, not bracing the ankles to force an up and down movement. The pressure on the stirrups and flowing with the natural movement of the horse will help a rider post. 8. How to clean and groom the horse. 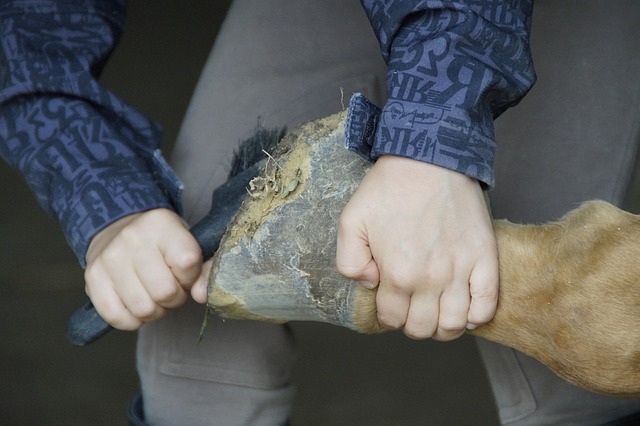 At the beginning or end of the lesson, the instructor will have you clean and groom the horse. You will learn about the different types of brushes and how to use them. Different types of bushes, such as the dandy brush and curry comb, are used on different areas of the horse’s body. The mane and tail require a different brush than the body and face. You’ll also learn how to pick a horse’s hooves. Once you’ve mastered these beginner horseback riding skills, you’ll move onto intermediate skills such as jumping and cantering. The key to learning to ride a horse is to be patient while mastering the horse riding basics. Many riders are eager to canter and want to move at a faster pace. However, taking your time as a beginner is essential in order to become a well-trained and safe rider. The instructors at Cramer Quarter Horses love working with new students. Horseback riding lessons for beginners are available at their location in Needville, Texas. Lessons are available for children and adults at a variety of skill levels and riding styles. Get more information on horseback riding lessons here.